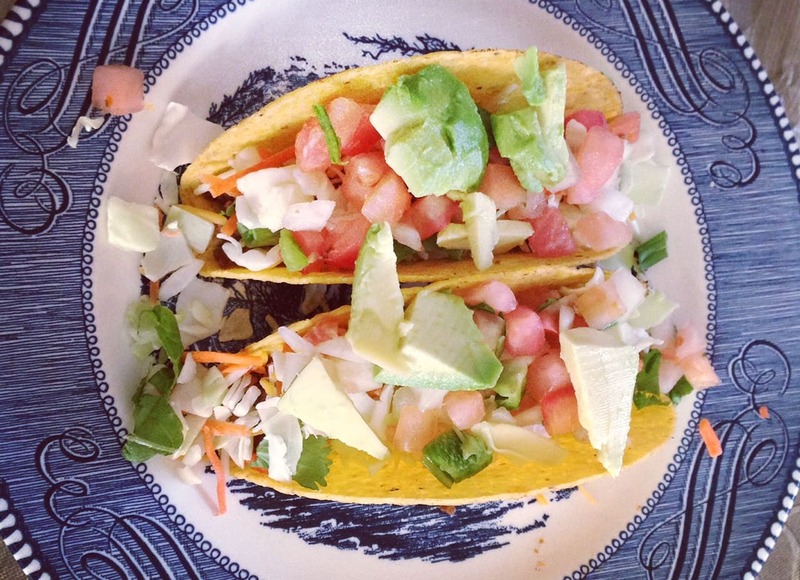 Homemade tacos courtesy of my friend Jacki! Lupita London is a Mexico City style restaurant that has three locations in London – one is very close to my office in Covent Garden. You must order the guacamole which is made tableside, it ranks up there with any I have had in Texas. They also have a wide selection of tacos which are all excellent. I can also highly recommend the chicken enchiladas, just like when my friend Jacki makes them. Lupitas Restaurant also has burritos, but I prefer the tacos or enchiladas. The margaritas at Lupita restaurant are also excellent, especially the fruit ones. My favorite is the mango, but the passion fruit is pretty good too. I recommend ordering a pitcher of the best margaritas in London, these go down easy! 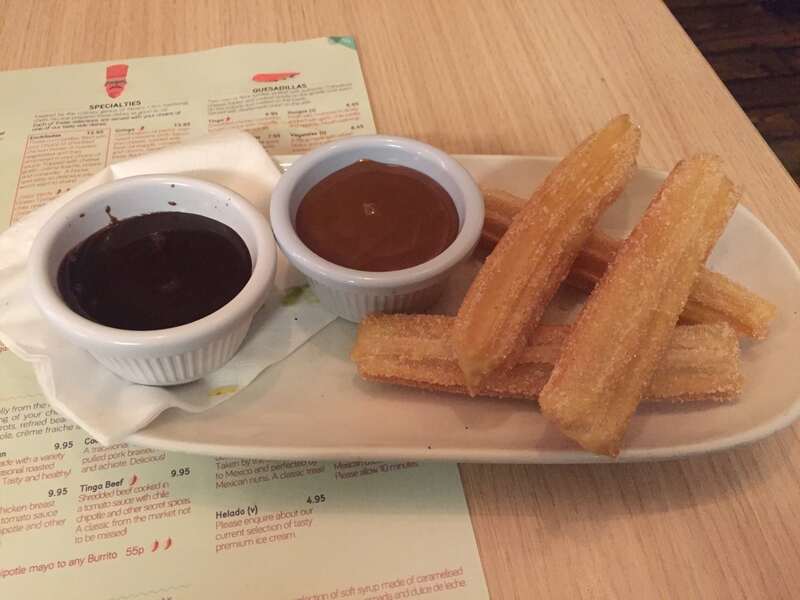 For dessert, the churros are excellent and come with either chocolate or caramel sauce. Our waiter was really nice and gave us both. The menu says that the churros will take 10 minutes, but it seemed like they came out faster than that. Lupita’s Mexican Restaurant also has lunch specials during the week. It is a popular place so make a reservation if you have a party of 6 or more or try to go early. 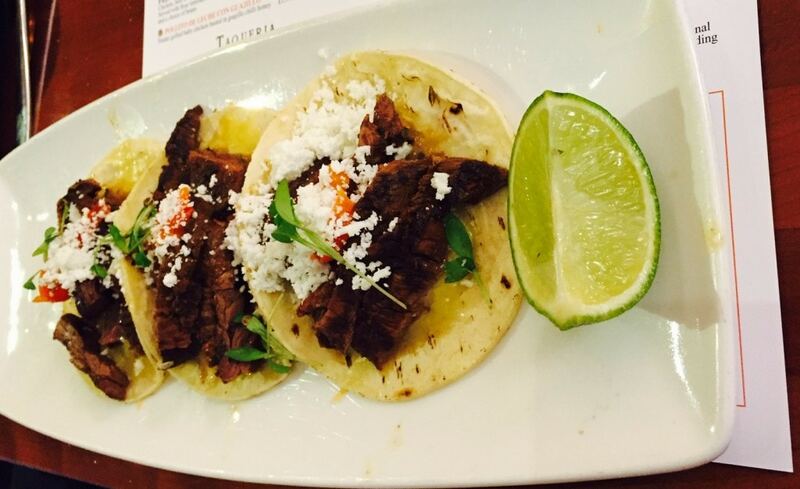 The Campechano tacos, which are a combination of steak and sausage (chorizo). The tacos and enchiladas at Lupita are excellent! Cantina Laredo is a modern Mexican restaurant located in the heart of the theatre district with a nice outdoor patio and bar area. For starters, their guacamole is made table side and they also have chile con queso. For my main course, I had tacos, but they have a good selection of traditional favorites. We went with a large group and everyone enjoyed the dish they ordered. Their signature drink is the Casa Rita and it was excellent. I also tried the avocado margarita, which was good, but I preferred the Casa Rita. They also have a pre-theatre menu where you can get a set two or three course meal for a discount before 6:30. Be sure to join their mailing list, they send out great discounts. The enchiladas tasted as good as they look! 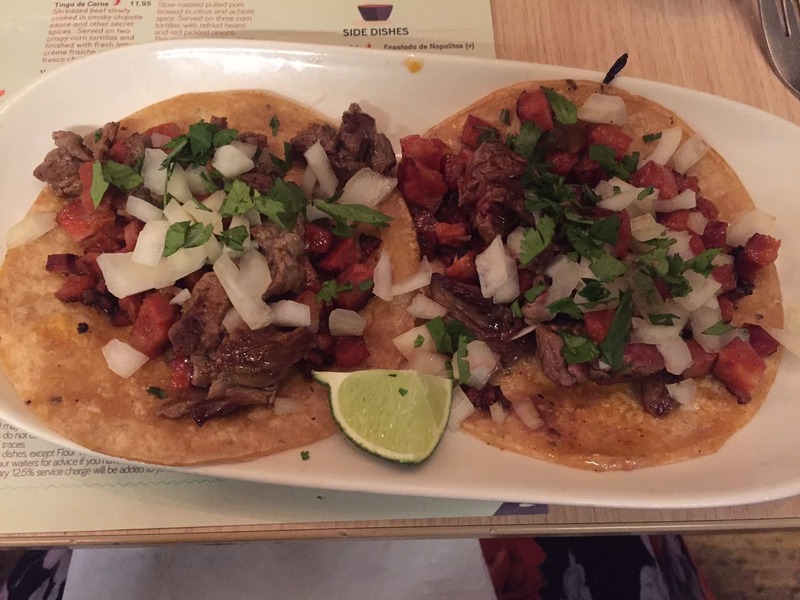 Mestizo is a traditional Mexican restaurant with an excellent selection of tequilas, that is located close to the Euston Square tube station. They were really accommodating to us when we visited. We got there for an early dinner on Saturday after our visit to the British Museum and they were having a plumbing issue so had to close the downstairs section. Even though we did not have a reservation they squeezed us in. The food was excellent. 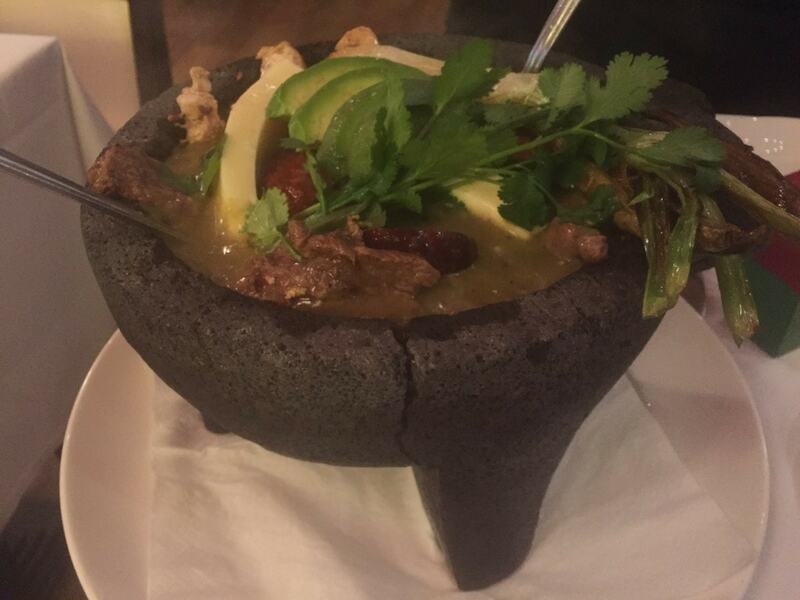 For our main course, we had what they call the perfect sharing dish – Molcajete ‘Mestizo.’ It is served in a large volcanic stone bowl and you get to choose which meats and sauce you like. We had a combination of chicken and beef with a tomatillo sauce. The dish also had chorizo, which was really good. One of the restaurant’s other specialties is their mole sauce. 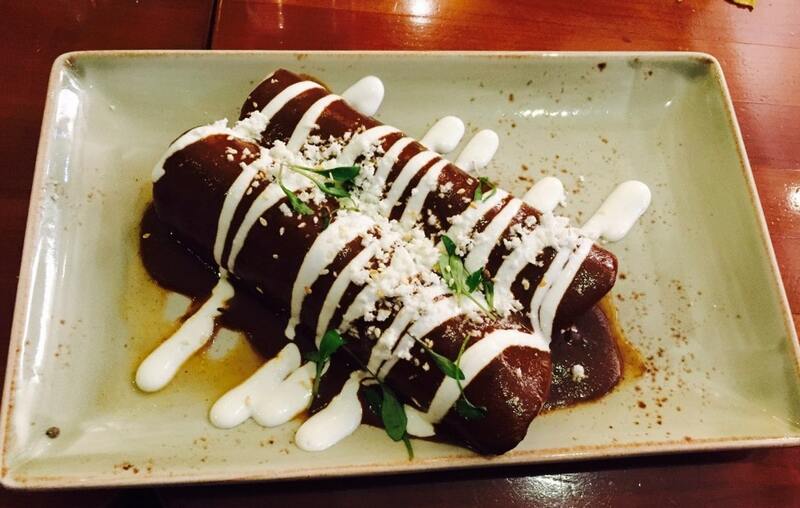 I think next time I go, I will try the Enchiladas de Mole. There is also a location in Madrid. Wahaca is a trendy Mexican restaurant that was founded by Thomasina (Tommi) Miers, who won the British MasterChef competition in 2005. The menu is filled with interesting twists on Mexican favorites. Many of the dishes in the street food part of the menu are tapas sized so I would encourage you to order a bunch and share. The guacamole, while not made tableside, is an excellent choice to start with. I was very excited to see that they have a taco featuring one of my favorites food – plantains – but all the tacos we tried were excellent. Their cocktail list is also very innovative. My favorite was the hibiscus margarita. They also have one of Katherine’s favorite drinks, a michelada (which she recently enjoyed in Costa Rica). Wahaca has locations throughout England. I visited the location in Covent Garden. 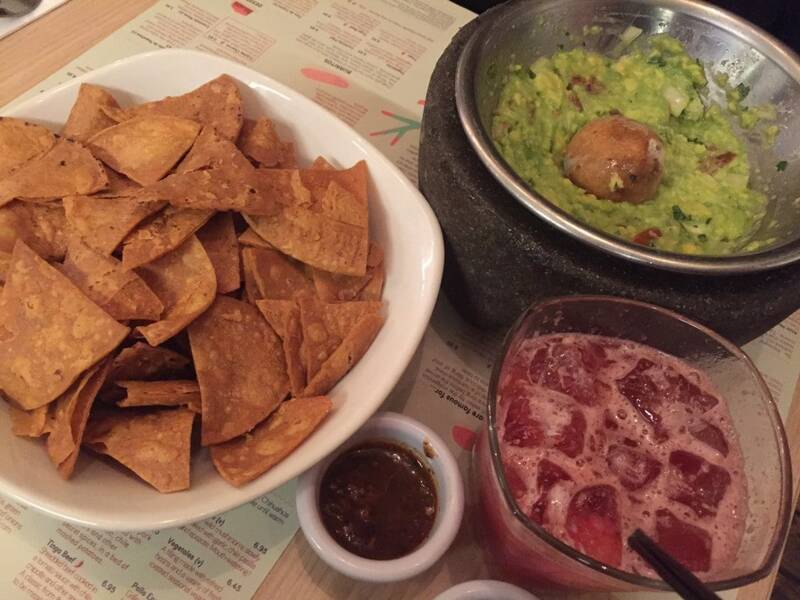 At the Oxford Circus location, you can also get a Mexican breakfast. 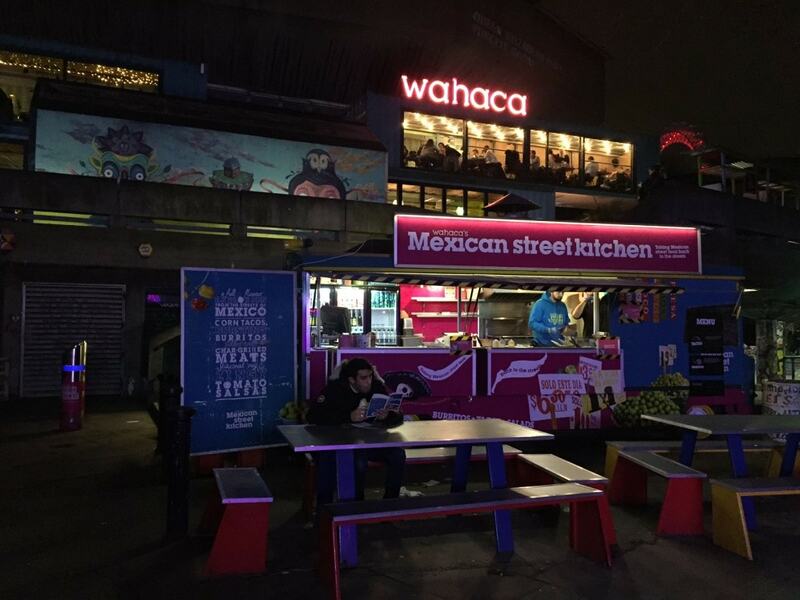 The Wahaca location on the South Bank overlooks the Thames. 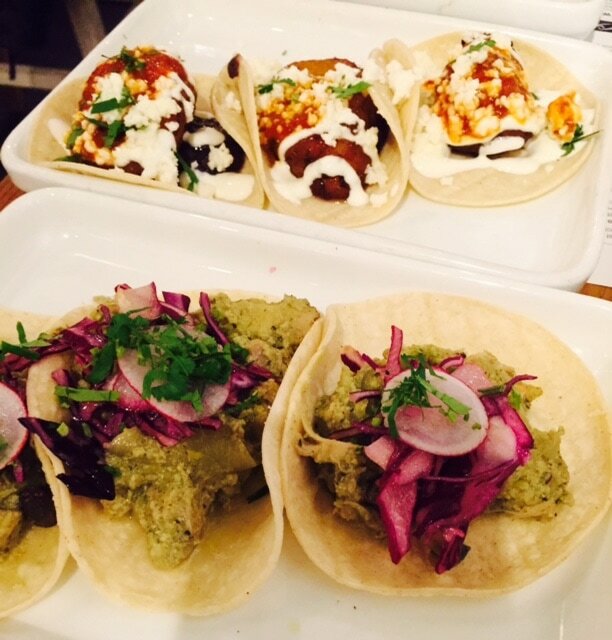 A selection of tacos, delicious! 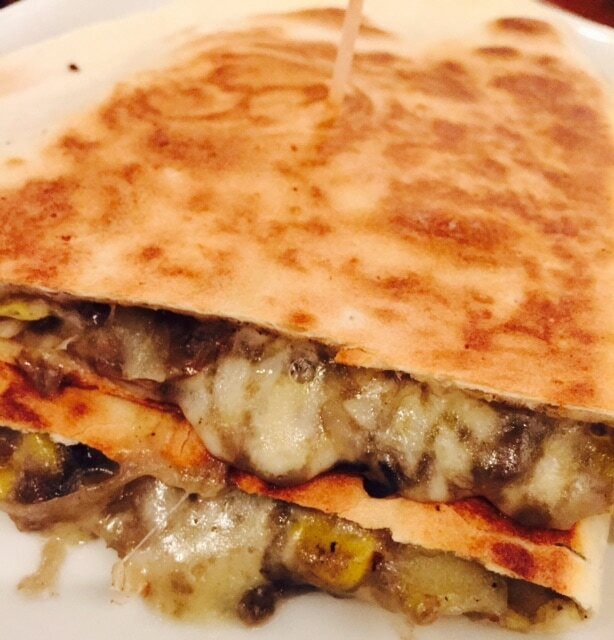 The quesadilla was nice and cheesy! Mexican food is definitely growing in popularity in London, so I do recommend getting reservations in advance for these restaurants. I should also mention all these restaurants have lots of vegetarian and gluten-free options. None of these restaurants’ food was too spicy, although I am sure you can request dishes spicier if you like. 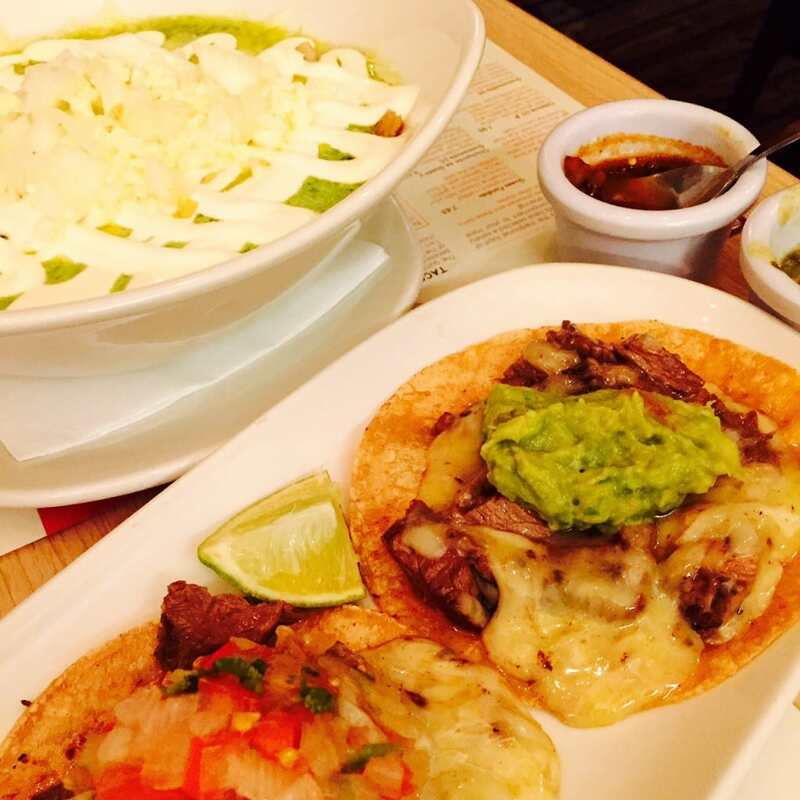 Have you tried any Tex Mex or Mexican food restaurants in London? I know there are some that are disappointing. If there is one you think I should try, I would love to hear about it. Be sure to book a reservation in advance for any of these Mexican restaurants. All these restaurants have lots of vegetarian and gluten-free options. Some of that does look awfully tasty. It’s nice to know you can get good margaritas across the pond. Yes! It’s not easy to find good margaritas but these places all have really good ones. The research for this post was hard (lol) but somebody had to do it! Thanks for stopping by and commenting. Thanks Julie! You will definitely need to check out these places when you go. I have lived on the Texas/Mexico border, as well as in Corpus Christi, Austin, and the Dallas/Ft Worth area much of my life. Some of the food photos you posted look like much of the food I’ve grown up on. But you are pretty brave–I’ve never tried Tex Mex or interior Mexico’s food any of the times I’ve been in London. Good for you! Becky – Thanks! I did also try some places that were not as good. I think the food in London (all cuisines) has improved a lot in the last 5-10 years. If you get the chance, I think you would really like the places in this post. Love it guys! I’m always searching for decent Mexican in London and it’s tough to find! Cass – Thanks! Glad to help. Guys, this food is making my mouth water. I know London is well-known for its Indian food but it’s nice to know that finally, I can find some good ol’ Tex-Mex when I need a change-up. Thanks for sharing this on #TheWeeklyPostcard. Linda – Yes! I was pleasantly surprised. I hope you get to try some of these places. Thanks again for stopping by. I’m heading to London again in a few weeks and these suggestions sound perfect. I love my Mexican dinners!! Excellent! Glad this blog post is helpful. Hope you have a great trip. Thai is fantastic! Considering I love Mexican and I live right by London I’ve only been to Wahaca. I’ll have to visit the other two. Thanks for the tip! Excellent! And let me know if you find any others, I’m always in the mood for tacos! As a California native, we also have really good Mexican food. While I was in Europe, I missed good Mexican food so much! This is helpful. I’ll definitely have to try out these places when I’m in London again this summer! That’s great I’m glad you found it helpful! Nida – Always nice to run into a fellow Texan! Happy to help. I think you will like these places. Enjoy your time in London.